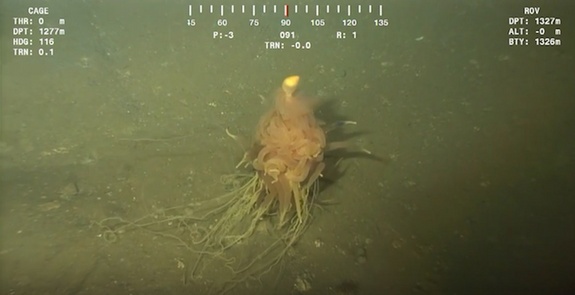 This creature looks like a bowl of pasta spilled at sea. Bathyphysa conifer is the name of the unique creatures that. It was the animal inhabitants of the deep sea can be found swimming in the Angola sea, at a depth of 1,220 meters. 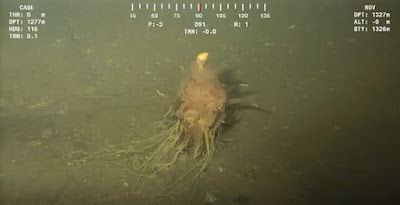 The oil workers who first discovered this creature, record it using an unmanned underwater vehicle (ROV), and nicknamed it 'Monster Spaghetti' (as the creature's tentacles forms very similar to spaghetti). After investigation, B. conifer turns into the kind siphonophore such as jellyfish and coral. Siphonophore defined as animals that live in colonies. B. conifer composed of multicellular organisms called zooids. The zooids itself actually is an intact animal, but they live sticking with other fellow zooid, thus forming one larger organism: B. conifer.